Why we need to protect map databases in the age of Trump. Access to information is under threat like never before. 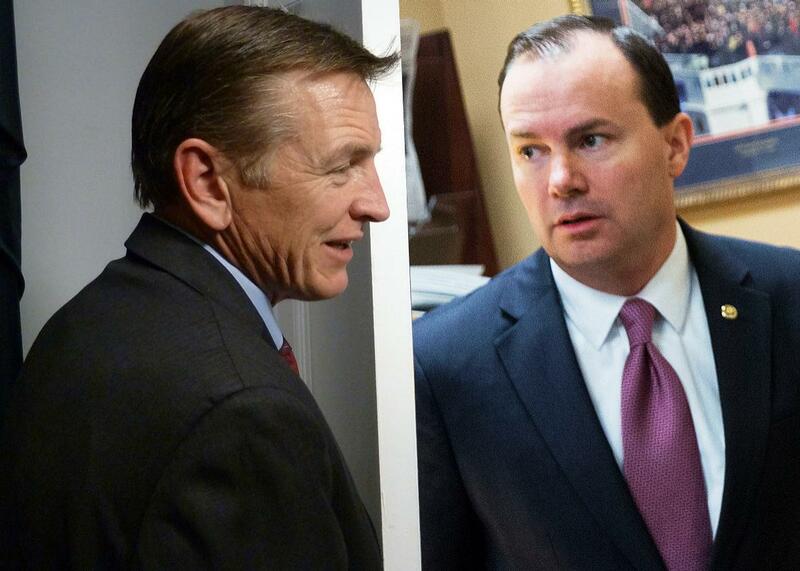 Rep. Paul Gosar of Arizona and Sen. Mike Lee of Utah. Photo illustration by Slate. Photos by Raphaelle Picard/AFP/Getty Images; Drew Angerer/Getty Images. In the chaos of the Trump administration’s first couple of months in office, most people have continued not to notice these two bills. But many American geography and mapping professionals as well as fair housing advocates and academic researchers, are sitting up and paying attention. That’s because these bills include language that would actively prevent federal funds from being used to create and maintain geospatial databases covering affordable housing access and racial disparities—cutting off a key source of accessible and easy-to-use information for researchers and communities. (Geospatial data is data that’s associated with a particular geographic location). Gosar’s and Lee’s bills are unlikely to become law in the near future. They have merely been proposed, the first step of an arduous process that few bills manage to survive. And past efforts to introduce similar legislation have failed. Lee introduced a previous version of S.103 back in 2015, while Gosar offered an amendment seeking to defund the housing regulation in 2014 and a bill similar to H.R. 482 in 2015. But the 2017 re-introduction of these bills feels more menacing in the age of Trump. Since his January inauguration, Trump’s administration has embarked on a decidedly public war against government-held data, terrifying a wide swath of data users and producers, including climate researchers, animal welfare advocates, wildlife researchers. In late April, the Environmental Protection Agency removed climate information from its website as part of an “update” process. In this climate, it doesn’t seem impossible that these bills—or other proposals with similar language cracking down on geospatial databases, map-making, and other types of data collection—could become law. That’s why we need to keep an eye on this kind of legislation. While geospatial databases may sound boring to the outside observer, they’re actually fantastically important for a wide array of fields: These aggregated collections of locational data can be used to track the spread of infectious disease, indicate a link between disadvantaged neighborhoods and high blood lead levels, and pinpoint the ideal location for a new Target store (and much, much more). The federally funded database under attack in H.R. 482 collects a wide range of data sets on community racial disparities and housing, presented in such a way that both researchers and average citizens can use it. So why do these Republican lawmakers want to defund it, removing that public access? The “secret race database” Sperry describes is actually called the AFFH Data and Mapping Tool, and it includes data on income, age, race, education, environmental quality, housing status, and more. Its name comes from the fact that it was created by the Obama administration’s 2015 HUD Affirmatively Furthering Fair Housing Final Rule. The AFFH, in simplest terms, is an effort to ensure 1968’s Fair Housing Act is actually enforced. The Fair Housing Act was passed with the noble intention of ending housing segregation in the United States. As part of its mandate, it required federal agencies like the Department of Housing and Urban Development to “affirmatively further” fair housing. It all sounded good on paper, but as ProPublica described in this excellent 2012 longform piece, the act was quickly rendered toothless. Nixon housing chief George Romney (yes, the father of Mitt) ordered HUD to reject grant applications from communities that weren’t working to decrease segregation. The backlash from Nixon’s supporters was immediate, and the president quickly moved to quash Romney’s program, eventually driving him from the Cabinet. Well-aware of the controversy surrounding housing integration, succeeding presidents and lawmakers declined to use HUD’s main source of leverage in the pre-AFFH era: withholding federal grant funds from recipients that didn’t comply with the act. Community Development Block Grants were introduced in 1974 and quickly became a key source of funding for local governments, covering not just housing but a number of other public services. The funds came with a condition: Recipients had to complete and submit an analysis identifying obstacles to integration in their communities as well as describe some actions that might remove them. As ProPublica found, communities that failed to fulfill these conditions were almost never cut off from grant funding—even when they were in obvious violation of the rules. A 2009 internal HUD study found many communities didn’t bother to fill out or update the required Fair Housing paperwork, hobbling the government’s ability to monitor community compliance with the fair housing rules. Even communities that wanted to comply with the Fair Housing Act lacked guidance on how to do so. While the original act gave government a mandate to “affirmatively further” fair housing, it didn’t specify what “affirmatively furthering” actually looked like—and HUD didn’t specify what had to be included in the analysis, nor did the department review or approve these analyses when they were completed. This long-standing failure to enforce the Fair Housing Act has had concrete consequences. Segregation is alive and well in the USA: Public schools have actually become more segregated by race and income since 2000, while affluent black families still tend to end up living in poorer and more segregated communities. The 2015 AFFH meant to change all this. It created real consequences for failing to adhere to the Fair Housing Act and offered better guidance for communities on how to go about complying. As of March 2017, there’s evidence that the AFFH rule has already begun to help make housing fairer in the communities in which it has been implemented. The data and mapping tool has likely been an important part of this early success. It was conceived as a way for HUD grantees to more easily conduct the fair housing analysis that AFFH requires. It was meant to be publicly available, making it possible for average citizens and community groups to better visualize the state of housing in their communities, using geospatial data and tables to represent important issues. The tool might even help people facing housing discrimination demonstrate inequality. Unsurprisingly, Lee and Gosar don’t agree with the reasoning behind AFFH and its accompanying mapping tool—and they’ve worked hard to portray the new rules as a direct threat to personal freedom. In an op-ed published in the Daily Signal in May 2016, Lee argued that the regulation was “designed to give unelected, anonymous bureaucrats in Washington the power to pick and choose who your new next-door neighbor will be.” A press release from his office justified the denial of funding to the geospatial database by claiming “it could be used to further the administration’s radical pursuit of using ‘disparate impact theory’ to punish communities that are not as demographically diverse as the administration would like.” Disparate impact theory is a legal theory that prohibits practices that may not have an overtly discriminatory intent, but nevertheless disproportionally impact members of a protected group. Much to the anger of conservatives, the Supreme Court upheld the application of disparate impact under the Fair Housing Act in 2015. The messaging from Gosar and Lee is clear, stylistic differences aside: The AFFH and the geospatial database that accompanies it make it harder for people to make their own choices about housing and the makeup of their communities, imposing top-down government control on local choice. Of course, this reasoning conveniently leaves out the personal freedom of people who can’t find affordable housing or face unequal access to basic neighborhood resources. It ignores the fact that segregation and inequality are themselves examples of social engineering—of a sort that primarily benefits the older, wealthier, whiter demographics that tend to vote Republican. And it doesn’t mention that the AFFH is simply an effort to ensure that regulations that have been on the books since the 1960s are actually enforced. Intentional data-avoidance out is a beloved strategy for the “la-la-la, I can’t hear you” crowd. Consider climate-change deniers who want to remove public access to climatological data simply because the data makes it harder to deny that the planet is warming. In another example, Congress has effectively blocked the Centers for Disease Control and Prevention from conducting research on firearm violence and its effects on public health. This isn’t purely an American phenomenon, either. France likes to view itself as a country with minimal issues with racism and discrimination. It’s hard to contradict this image because the collection of data on race or ethnicity has been illegal in France since 1978. Many other governments try to impose controls on map-making and geospatial data, using security concerns to justify their actions. The English government restricted public access to data from its ordnance survey until 2010, while the U.S. intentionally degraded public GPS signals until 2000. In more recent years, India has attempted to require all map-makers to secure a license from the government, while China has an ongoing battle against “illegal” mappers. Again, I think it’s entirely possible Gosar and Lee’s bills will die on the vine. But given the state of American politics, we need to keep a close eye on this legislation—and other bills like them that may be introduced in the future. On March 6, the Council of Professional Associations on Federal Statistics released a letter calling out the anti-database language in H.R. 482, while the American Association of Geographers put out a letter opposing the restrictions in late February. (The AAG will be hosting a Twitter chat on “Geography and the New Administration” on May 17 if you’d like to directly join the conversation.) The National Low Income Housing Coalition continues to push its members and supporters to publicly oppose these bills. These groups need backup: If you’re concerned about the impact of these bills on data, housing, and research, then it’s time to pick up the phone or send over a fax. Lawmakers like Lee and Gosar need to be made aware that efforts to clamp down on and obscure geospatial data (and other forms of data) will not go unnoticed by the American people. The stakes are high: If America is to improve itself, America must be able to know itself, and restrictions on geospatial data will make that self-knowledge harder and harder.